I work with a lot of floating-point images, and would find it extremely useful to have an image-based representation of my arrays. I'd like to create a WPF UserControl that renders the data array (as shown below) as an image, instead of a scrollable list of text values. Is this possible? I have looked at the MDSN documentation on VS 2010 extensibility, at SO's list of VS 2010 extensions, and at this topic on creating a custom editor, but I'm a bit lost on where to start. Thanks to Brian and Basarat Ali for the leads on DebuggerVisualizer. 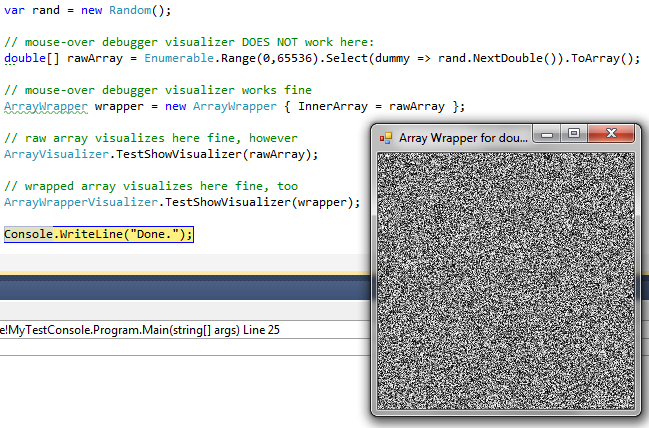 Looks like the correct strategy, EXCEPT that unfortunately a visualizer for any type of arrays is disallowed. A work-around (of limited utility) is to visualize a wrapper object. VS2010 Debugger Visualizers Contrib (http://debuggervisualizers.codeplex.com/). If anyone has any suggestions on how to work-around this problem, please let me know! Also, any explanation of why System.Array cannot be visualized is welcome! I just re-searched SO with the word DebuggerVisualizer, and find this to be previously asked. Looks like user Will Dean suggests implementing Project Mole's work-around using a WeakReference. Don't see how this would work in a DebuggerVisualizer, though. Hit the Enter key, then you should see a magnifying glass icon in the Watch window next to that line of code. Click it to open your custom visualizer. 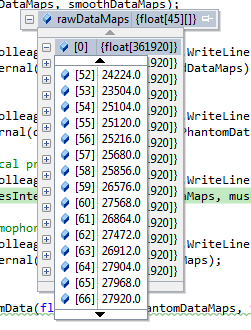 Since this is for runtime information in the debugger, you might consider a DebuggerVisualizer rather than an editor extension. There are some trade-offs, I am unclear which would be best for this. Not the answer you're looking for? Browse other questions tagged wpf visual-studio-2010 add-in data-visualization adorner or ask your own question. Debugger Visualizer not working? Have i incorrectly registered it?